Unrest in India continues to build, but its direction remains uncertain. On September 2, a one-day national strike brought much of India to a halt. Eleven central trade unions — national-level bodies affiliated with major political parties — issued the stop-work call. At the last minute, the Bharatiya Mazdoor Sangh (BMS) union pulled out of the strike. This was to be expected: the BMS has close ties to the ruling party in India, the Bharatiya Janata Party (BJP) as both belong to the Rashtriya Swayamsevak Sangh (RSS), a right-wing Hindu nationalist organization. Even without the BMS’s participation, however, union leaders expected the strike to draw large numbers, due to increasing discontent with the BJP’s anti-worker labor reforms. The unions announced afterwards that the strike was one of the biggest industrial actions in the world, with roughly 180 million workers taking part. Government officials downplayed it, claiming that the unions exaggerated their success. Whatever the numbers, we need to put this action in the context of past strikes and other ongoing protests — not all of which are progressive. Taken together, the political situation in India highlights an increasing sense of unrest and the difficulty of the task the Left faces. A summary of this year’s strike may provoke a sense of déjà vu, and for good reason: all of these things happened on September 2, 2015, as well — as I described in some detail at the time. In both cases, things returned to normal on the streets and in the factories on September 3. In some ways, these one-day strikes have shown unions’ strength. Even if 180 million participants is an exaggeration, tens of millions did participate — no small feat for a working class riven by divisions of caste, gender, religion, region, and sector. But these strikes also outline the central trade unions’ weakness. Like their counterparts around the world, they have been in decline for several decades, thanks to a sustained neoliberal offensive and many leaders’ accommodative stance. In India, these challenges have been exacerbated by the central unions’ sluggishness in engaging with informal-sector workers, who make up the overwhelming majority of the workforce (up to 93 percent, by some estimates). But even central trade union leadership has begun to recognize these weaknesses. In the run-up to this year’s action, leaders focused on issues that primarily affect the informal sector, including raising the minimum wage and extending social security benefits to unorganized workers. In addition, a new organization, outside the sphere of central trade unions, has formed to address these flaws. The group, called the Mazdoor Adhikar Sangharsh Abhiyan (MASA), draws together many movements and organizations from around the country. Unlike the mainstream unions, MASA is not affiliated with any political party, and it has poured its energy into supporting rank-and-file workers’ movements. MASA organizers, while skeptical of the central unions’ newfound commitment to grassroots organizing, supported the strike. But they see it as more than a symbolic one-day affair: it will kick off a more sustained campaign for workers’ rights. 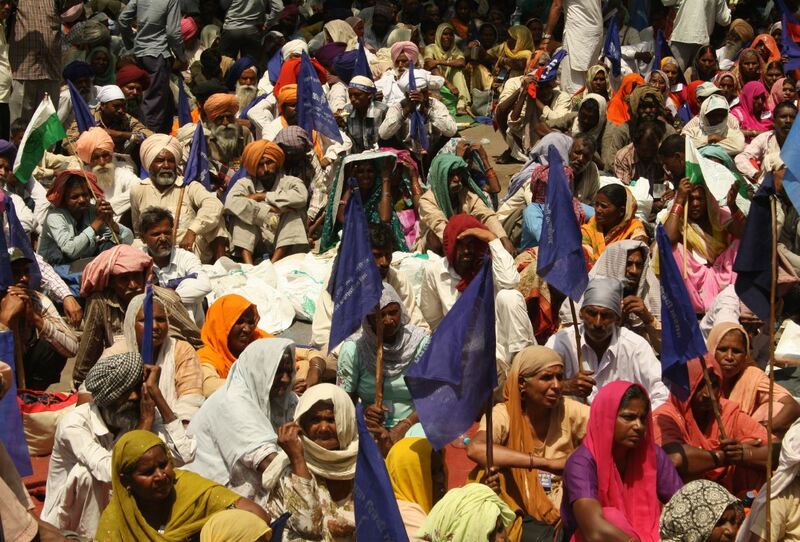 Organizations like MASA indicate a larger movement is coming and reflect a restive mood in India that extends beyond labor issues. The BJP won a convincing majority in the 2014 national elections, riding high on the popularity of their prime ministerial candidate, Narendra Modi. But now, roughly halfway through their term, Modi and his government face resistance from all sides. The party had campaigned with the slogan “Sabka Saath, Sabka Vikas” (roughly, “Development for All”). Modi promised to bring the “Gujarat model” of high economic growth nationwide. But, after failing to deliver on these promises, the government has leaned more heavily on its other plank: aggressive Hindu nationalism. This aggressive stance has informed the government’s response to the ongoing quagmire in Kashmir, a Muslim-majority region claimed by both India and Pakistan. The territorial issue serves as a stand-in for the rivalry between the two countries — both nuclear powers — who have already fought wars over the disputed land. The Indian portion of Kashmir is one of the most highly militarized zones in the world; the population lives under a virtual army occupation. On July 8, when a separatist militant was killed by Indian troops, widespread protests — which continue to this day — erupted. This prompted a brutal crackdown from the state. The use of pellet guns has left hundreds of Kashmiri protesters blind; to date, eighty-four civilians have died at the hands of security forces. Meanwhile, Modi and his cabinet have ratcheted up their rhetoric against Pakistan. The savage suppression of the Kashmiri protests is galling, but perhaps unsurprising, given the region’s troubled history and the BJP’s commitment to a muscular, Islamophobic Hindu nationalism. But the BJP has also faced challenges where its popularity seemed most secure, including the prime minister’s home state of Gujarat. A major challenge came a few months ago, when so-called cow vigilantes — observant Hindus who attack anyone suspected of killing cows — escalated their activities. Protecting the holy cow is one of the BJP’s Hindu nationalist commitments, but this has largely operated as an excuse to target Muslims: not long after Modi became prime minister, a man named Mohammad Akhlaq was lynched after a rumor spread that he had killed a cow. However, Muslims aren’t the only ones who handle cow carcasses. Such work has long been the domain of the Dalits: the castes formerly known as untouchables, who were forced to do work the upper castes considered polluting. The BJP captured a large chunk of the Dalit vote in the 2014 election thanks to a difficult balancing act: Modi promised Dalits a place in the majority Hindu fold but could not threaten upper-caste dominance in society. The impossibility of this position became clear when cow vigilantes attacked a group of Dalits in Gujarat on July 11, prompting an upsurge of protest and resistance. Dalits vowed to stop doing this stigmatized work, and, in several cases, they dumped cow carcasses at police stations. They organized huge rallies and protests, culminating in a massive gathering in Ahmedabad, Gujarat’s capital. One of the movement’s main demands was land reform, and specifically land distribution to Dalits, who have historically been landless. A prominent slogan translates roughly to “You keep your holy cow, just give us our land,” aptly dissecting the intertwined nature of religious and economic oppression under the caste system. One of the leaders who emerged from these protests was a Dalit activist named Jignesh Mevani. He had been engaged in grassroots politics for years but was catapulted into the national spotlight this July. Mevani is engaged with both Marxist and Dalit resistance, a challenging position considering the Indian left has long been upper-caste dominated. Indian Marxism tends to ignore caste in favor of a crudely deterministic class-based critique. There are some signs, though, that this is changing. After the Gujarat protests, the left-wing activists involved in MASA welcomed Mevani at an open meeting in Delhi. At the same time, however, some Dalit organizations have criticized him for not taking a critical enough stance toward the Left and its tainted caste history. Unrest is not limited to the most vulnerable sectors of Indian society, nor is there any guarantee that it will be channeled in positive directions. The Patidar community — an economically and politically powerful caste that has played a major role in Gujarat politics — has also staged protests. Despite the caste’s relative privilege, many feel that they have lost out in recent years, as the liberalized economy has created a greater sense of precarity for all. This is especially the case for rural, landowning Patidars, who have been squeezed by an agrarian crisis that was largely triggered by neoliberal reforms. The group has launched a sometimes-violent agitation to win reservations in government jobs, which have become more desirable as the sector has shrunk. India’s reservation system allots a certain number of public-sector jobs, legislative seats, and university enrollments to groups that have historically faced discrimination. An upper-caste group demanding these benefits overturns the system’s entire logic. If the Patidars have their way, the reservations will no longer right historical wrongs, but allow a historically powerful group to cling to its privilege. Instead of encouraging progressive alliances, then, the current economic and social upheavals can just as easily trigger violent behavior from those who fear that their power is waning. The looming threat of ecological crisis intensifies these viciously divisive politics. Recently, in the south Indian state of Karnataka, a dispute over water resources led to widespread riots and one death. The immediate trigger came from a Supreme Court decision instructing the Karnataka government to release water from a dam to provide the neighboring state of Tamil Nadu with irrigation water. Karnataka farmers opposed the court order, fearing that it would not leave enough water for them. Their peaceful protest eventually turned violent, as some targeted Tamil workers living in Karnataka. Both the media and the two state governments have fueled the tensions between Tamils and Kannadigas, framing the struggle as a zero-sum game between two rival communities. But the real story is one of ecological mismanagement. Groundwater tables have rapidly plummeted in the past twenty years thanks to the rush to industrialize and urbanize. At the same time, the government has promoted water-intensive cash crops in an increasingly capitalist agriculture sector. Add to this an erratic monsoon season — which will only become more unpredictable with climate change — and you have all the ingredients of a coming water war. In much of south India, the water protests overshadowed the September 2 strike. This points to the challenges the Indian left faces: they have to contend not just with the neoliberal assault, but also with caste divisions, regional rivalries, and environmental breakdowns — issues that it has historically struggled to address. Many recognize these shortcomings, and new groups and alliances, like MASA, are working to connect different struggles and movements. Such experiments are of critical importance, not just for fighting Modi and the BJP, but for the long-term project of realizing social, ecological, and economic justice for the country.